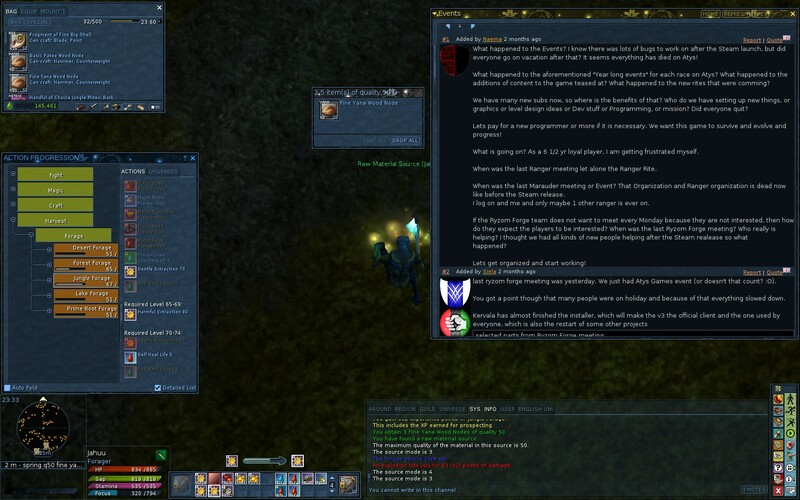 Forums » GENERAL » English » My cluttered screen. Yes, this is my NORMAL screen setup! start a teleport then press the V key and hold until teleport is complete then release the V key!!!! It looks like you could collapse a few windows so they were smaller, or close some (like Animals) that won't be used very often, but mine is very similar. Edit: Found more cluttered one. Some of us prefer having all the information in front of us. Just decide what you need to see all the time ... versus what you don't need to see ... and what there's room for so as to allow a wide enough viewing area that you have some periheral vision when digging in scary spots. It would be a good idea to peek at as many UI setups as possible so you can try various setups pick what best suits your individual play style. Mine is pretty much the same as it was 13 years ago, tho it has evolved slightly over the years. Missions - Only pop up when needed, i.e. when oi forget exatly what I was doing. Mailbox - Only opened when Compass says "You got mail"
SCREEN RESOLUTION: - On 1080p screens I play at 1920 x 1000 leaving an 80 pixel space at screen bottom woth a pop up bar utility (not shown) for access to Browser (Silends, BM, etc), KipeeCraft, Zyroom, Yubo Maps, SS based Bunny Tools, etc.